INT 600 Masking Tape is a general purpose film-based tape which has a specially formulated polysiloxane adhesive which retains its cohesion and adhesive properties under high temperature and has an excellent resilience to solvents, moisture and chemicals. Many components and printed circuit board locations must remain uncoated. INT 630 anti-static polyester based conformal coating masking tape offers the perfect solution to ensure areas for use as connector locations or insertion areas for interchangeable devices remain free of the protective coating. INT 701 polyimide masking tape is a polyimide film with a silicone adhesive. It is used for temporary masking during high temperature processes, including soldering. Polyimide film retains its excellent physical and electrical properties over a wide temperature range. 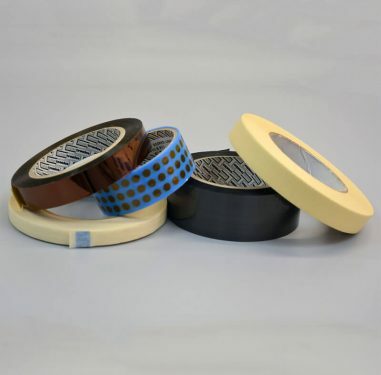 INT 702 Anti-Static Polyimide Masking Tape is a unique product for masking printed circuit boards during the soldering or conformal coating process. INT 745 Low Cost High Temperature Solder Masking Tape is a high temperature, paper-based tape for masking during the wave soldering process. INT 755 is based on crepe paper, coated with a silicone adhesive. Applications involve any high temperature masking, include wave soldering, hot air levelling (HAL), powder coating etc. Designed for masking component holes or areas on pcb’s during flow soldering or conformal coating, these pressure sensitive solder masking discs will withstand a five to eight second exposure to molten solder at 250°C.